This you have to try if you have your own blog or site. It has been 15 months since I have joined Adgitize. 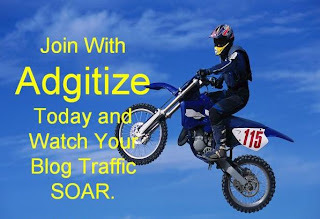 In Adgitize by the way, you need to install their widget to display ads from advertisers. In return for displaying and clicking ads in the widget, you will earn points. Points earned at the end of the cut-off time (1 P.M. Singapore Time) will earn you $$$. Now back to my history with Adgitize, it has been 15 months but I only earned $15.41. That's why I stopped using the system until I learned the trick from Jade just last week of March. In the month of March, I have earned $4.65. Cool, right? I am now earning 0.60 to 0.70 a day. So for a month, I can possibly earn $21. 4. Buying ads from Adgitize - 80 points for each ads. Aside from earning, you can also earn more page views and new readers. And definitely has helped improved my Alexa ranking. Hopefully, my Page Rank soon. you will get 100 points for the first paid ad in Adgitize. As you have two ads running, you'll get additional 50 points for the second ad. For a third (13$) & fourth (12$) ad you would get for each additional 25 points. You get 10 extra points for being a (free) preferred publisher which requires you to reach within 4 days 300 click points (minimum of 100 click points on 3 days in a 4 day period). You can upgrade to a paid preferred publisher for 6-8 $/month. This will give you additional 25 advertiser points and your blog will be shown for that month always in the "Blogs not clicked today"-List (gives you up to 15 visits/daily). My secret of getting an ad paid by Adgitize might be helpful for your readers! I earned na $18 last month, bakit wala pa ko nabayaran, how often ba adgitize pay? You should reach 10 before receiving the money. Inthink every 8th of the month they will send you.